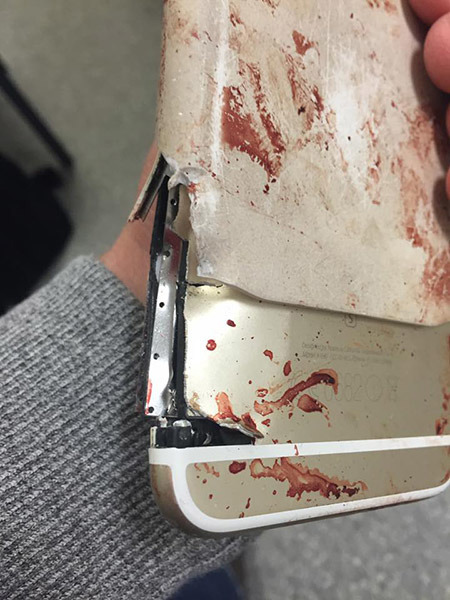 An iPhone 6s is being credited with saving the life of a woman who was injured in Monday's terrorist attack in Manchester, England, after the device deflected and slowed down shrapnel from the bomb blast. Recounting the harrowing scene, the husband of Lisa Bridgett, 45, said in a Facebook post that his wife was speaking on her iPhone when Salman Abedi detonated an explosive device that sent material hurtling through the air. A steel nut cut through Bridgett's finger and hit the bottom portion of her iPhone, which deflected the metal piece from its original path. The nut ultimately passed through Bridgett's cheek before coming to rest in her nose. 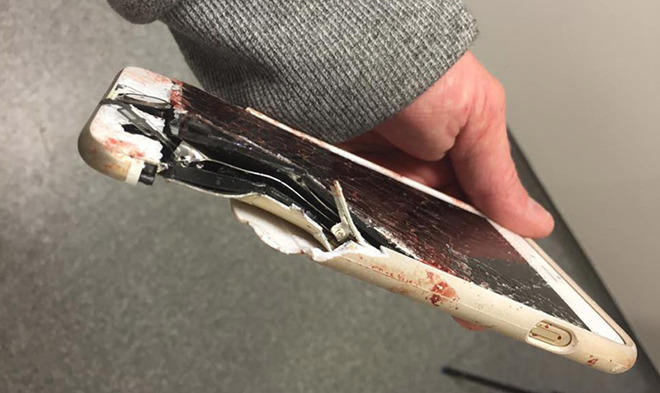 As seen in photos provided on Facebook, the nut appears to have torn through the iPhone's aluminum chassis, loudspeaker, logic board and display assembly. Whether the components actually changed the metal piece's trajectory is up for debate, though iPhone 6s was designed to be more robust than its predecessor. Following the so-called "bendgate" controversy, which criticized iPhone 6 Plus for being easily deformed during normal use, Apple turned to stronger 7000 series aluminum with iPhone 6s and 6s Plus. The material was initially deployed in the original Apple Watch Sport and is now used to build both Apple Watch and iPhone 7 products. Bridgett, who was at the Manchester Arena to pick up her daughter and her daughter's friend from that night's Ariana Grande concert, was subjected to multiple injuries from the bomb blast. Aside from the severed finger and face wounds, she suffered a thigh wound, fractured ankle and minor scrapes and bruises. On Facebook, Steve Bridgett said his wife "is in a positive mood and feels very lucky to be alive" following the incident. He elaborated on his comments in an interview with The Guardian. "The fact that she was on the phone at the time probably saved her life," Bridgett said. "The nut has hit her phone, which has more than likely not only diverted it but also slowed it down considerably." He went on to thank local police, first responders and hospital workers for their rapid effort in dealing with the attack that left 22 people dead and another 64 injured. The Manchester incident is not the first time an Apple product has been credited with saving a life. Earlier this year, a MacBook Pro took a stray bullet during a deadly shooting at Fort Lauderdale airport in Florida, likely protecting its owner from grave harm.